Location of Mesosaurus remains shown in blue. Mesosaurus is an extinct marine reptile from the early Permian of southern Africa and South America. It was one of the first known marine reptiles, and had many adaptations to a fully aquatic lifestyle. It is sometimes considered an anapsid, but there is some disagreement about that. It is described by Benton as a 'parareptile', that is, a sauropsid. 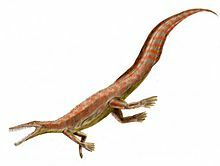 Mesosaurus was one of the first reptiles to return to the water after early tetrapods came to land in the later Devonian. It was around 1 metre (3.3 ft) in length, with webbed feet, a streamlined body, and a long tail that may have supported a fin. It probably propelled itself through the water with its long hind legs and flexible tail. Its body was also flexible and could easily move sideways, but it had heavily thickened ribs, which would have prevented it from twisting its body. Specimens show it was viviparous, bearing live young. Mesosaurus had a small skull with long jaws. The nostrils were located at the top, allowing the creature to breathe with only the upper side of its head breaking the surface. Its teeth were suitable for catching small nektonic prey such as crustaceans. Mesosaurus was significant in providing evidence for the theory of continental drift, because its remains were found in southern Africa and eastern South America, two far away places. As Mesosaurus was a coastal animal, and therefore could not have crossed the Atlantic Ocean, this distribution indicated that the two continents used to be joined together. ↑ 2.0 2.1 Huene, F. von (1940). "Osteologie und systematische Stellung von Mesosaurus". Palaeontographica. Abteilung A. Palaeozoologie-Stratigraphie 92: 45–58. ↑ Piñeiro, Graciela (2008). "Los mesosaurios y otros fosiles de fines del Paleozoico". In D. Perera (ed.). Fósiles de Uruguay. DIRAC, Montevideoy. ↑ Benton M.J. 2015. Vertebrate palaeontology. 4th ed, Wiley Blackwell, p126. ↑ Laurin, Michel (2010). How vertebrates left the water (illustrated ed.). University of California Press. ISBN 978-0-520-26647-6. ↑ Palmer, D., ed. (1999). The Marshall illustrated encyclopedia of dinosaurs and prehistoric animals. London: Marshall Editions. p. 65. ISBN 1-84028-152-9. ↑ Pineiro G.H. et al 2012. The oldest-known amniotic embryos suggest vivparity in mesosaurs. Historical Biology 24 620–630. ↑ Modesto, S.P. (2006). "The cranial skeleton of the early Permian aquatic reptile Mesosaurus tenuidens: implications for relationships and palaeobiology". Zoological Journal of the Linnean Society 146 (3): 345–368. doi:10.1111/j.1096-3642.2006.00205.x. This page was last changed on 2 March 2018, at 18:16.